I finished the Christian-Themed Block that I had been asked to do. I hope my friend likes it. I used some Mettler Silk Finish 100% cotton thread for the red appliqué and it was lovely to use. I had written to Mettler a while ago asking for some information on this thread as I read somewhere that it’s very good for appliqué. Previously I had only heard of people singing it’s praises as a great machine quilting thread. I got a lovely email from Michelle Macready from McCalls and then she sent me some printed colour charts and three spools of thread to sample. One was this lovely red Silk Finish, one was a Hand Quilting Thread and the third was a polyester thread. I’ve used the hand quilting thread as a test and I really liked it too. There’s a nice range of colours in the Silk Finish and I think I may just have to stock up on a few. Very lovely. I’m totally clueless about thread. I ordered some from Connecting Threads, but haven’t used it yet. It seems to be quite popular, and they have lots of very pretty colors. Your block turned out lovely. 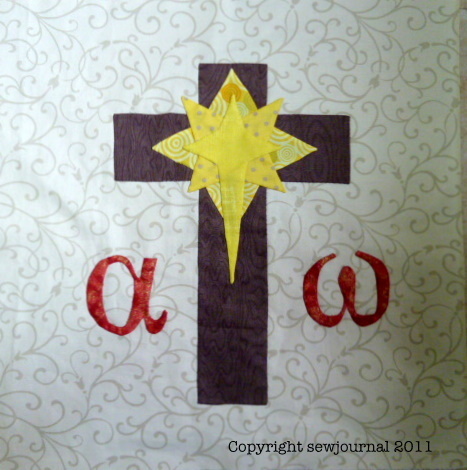 I have been asked to teach series of classes on making a Bible quilt next year. Most of the blocks are more traditional patchwork. Did you design this one yourself? I’m glad you like the block. Yes I did design it myself. Do you know the weight of the Mettler thread they sent you? It’s the 60 wt. that I use and just love for my needle turn applique. I so agree with you about the Mettler 60wt. It ‘s just lovely to work with in “needle turn applique”. I should really call it “round toothpick turn applique” because that is really what I use. Works for me. They sent me 50wt. Though 60wt would have been even better.